What To Do With Shayne Gostisbehere? After being disappointed in the Frozen Four in 2012, Shayne Gostisbehere found redemption in 2014 as the Union College Dutchmen trounced the Minnesota Golden Gophers by a score of 7-4 to win the school’s first National Championship in ice hockey. Gostisbehere displayed one of his finest games scoring a goal, adding and assist, and being +7 on the night. The junior certainly turned a few heads showing just how brilliant a player he is to watch. His effortless skating, vision all over the ice, booming slapshot from the point, and hockey sense/positioning, Gostisbehere looked as though he could slip into an NHL lineup immediately. And if you read anything that was sent out over Twitter, you’d know that Flyers fans not only want him signed, but to play his first NHL against the Hurricanes. People were drooling over Gostisbehere’s skill all weekend, but rushing him in to the NHL may not be the greatest idea. With all of his attributes (some of which are much needed on the Flyers’ blueline), Gostisbehere is still undersized and could use a couple extra pounds added to his skinny frame. As you very well may know, the NCAA with the NHL/AHL are two completely different ballgames. The NCAA season revolves around a 40-game schedule. More time is focused on practice and training in college, where as the NHL stresses the same amount of practice/training with an extra 42 games. The rigors of a full NHL season is difficult for young college players. The skill level isn’t nearly the same either. In college games, there may be a few standouts who excel, but take those players and put them into a professional hockey game and you likely won’t see the same superstar out on the ice. Jumping to a better league is accompanied by an increase in skill sets and players who think at a higher level. You simply can’t get away with stuff in the NHL that you can in college hockey. This is not to say Shayne Gostisbehere’s game won’t translate to the NHL. In fact, he will likely have a productive NHL career. His speed, defensive instincts, and offensive prowess lead me to believe he’ll be a poor man’s Al MacInnis. Assuming Kimmo Timonen retires and Andrew MacDonald doesn’t get the contract he wants from Paul Holmgren, the Flyers could be losing two very solid defenseman this offseason and will be trying to find replacements. Is Shayne Gostisbehere a potential fill-in? Yes…but he shouldn’t be right away. He doesn’t have much left to prove at Union College having just won a National Championship. Even though hockey is a team game, Ghost is the big man on campus right now. It’s going to be tough for him to leave a school he’s poured so much into and they have as good a shot as any at returning to the Frozen Four next year if he returns to the lineup. As of this morning, the Flyers still have not signed him and he’s headed back to Union. It is refreshing to see the Flyers holding onto (and developing) a draft pick of their’s for a change. Ultimately, it will be all up to Shayne on whether or not he wants to make the step to the professional level – where he will almost certainly play a full year in the AHL. Defenseman take a long time to develop, so Gostisbehere is likely a few years away at most. From a Flyers perspective, although the talent is readily available, there isn’t much of a reason to rush him into the spotlight. 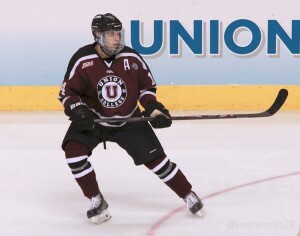 Staying another year at Union College might do some good.